When I am in Norfolk I spend a lot of time walking with my parents. At this time of year we rarely make it as far as the coast. For some reason it is at Christmas that we venture to the beach for bracing walks along the wintery sand dunes. In Autumn we stick closer to home, more often than not frequenting a stretch of the Peddar’s Way, the Roman road that cuts in a characteristically straight line across the county, beginning at the Suffolk border and coming to an abrupt halt at the sandy beaches of Holme-Next-The-Sea. The section of this ancient thoroughfare that passes through our family farm is little more than a dusty track lined with gnarled, overhanging hedgerows and grassy verges, full of dead nettles and sprawling brambles. This is by far my favourite place to come walking with my dad. It may lack the spectacular, expansive beauty of a stroll along the two-tone cliffs at Old Hunstanton or the lush verdancy of the woodland around Sandringham, but for me this unassuming, leafy path is so much more interesting. 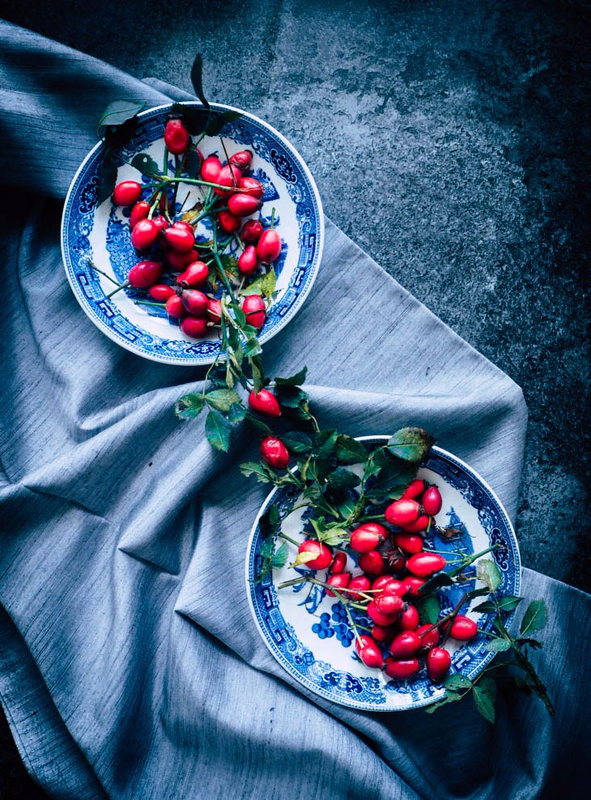 It is here that my family has always come to pick crabapples, blackberries, rosehips and sloes and it is the setting of many happy memories – for me and for generations of my Norfolk clan. Dad has often said in recent years that when he walks around the farm, and along the Peddar’s Way he sees ghosts (my father is an author and subsequently leans towards a rather poetical take on things). He doesn’t mean this in a Halloweeny, gruesome way at all. It is merely that these lanes and fields were the backdrop for his whole childhood, and almost every tree, ditch and pit (what non-villagers would call a pond) was the site of some youthful escapade or other. As he walks these familiar trails, the sight of a particular blackthorn tree, or a shady hollow will trigger some long-forgotten memory and here, without fail, on every walk I take with him I hear something new. I learn about summer picnics in the now-levelled chalk pit, surrounded by wild thyme and butterflies; of running behind the combines at harvest time to catch rabbits and of Decembers of furious activity plucking Norfolk Bronze turkeys ready for the festive season. He paints a picture of a time when farming was not so high-tech and hands-off, and before childhood moved indoors to take up its current position in front of a computer screen. On our last walk he told me about the decommissioned army truck that my wonderfully eccentric grandfather bought after the Second World War. On autumn days the family would drive this beast up the lane and essentially park in the hedge. My dad and uncle would then scramble up through the gun hatch to pick the best sloes and crabapples that would have been far out of reach from the ground. 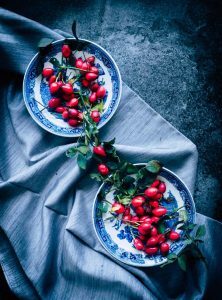 I love hearing these stories as we walk that patch of path with bagfuls of berries and apples that will be made into jams, jellies and gins, using the same recipes and, in many cases, the same cooking pot that my family has used for generations. Call me sentimental, but this connection with the past is what I love about rural life. 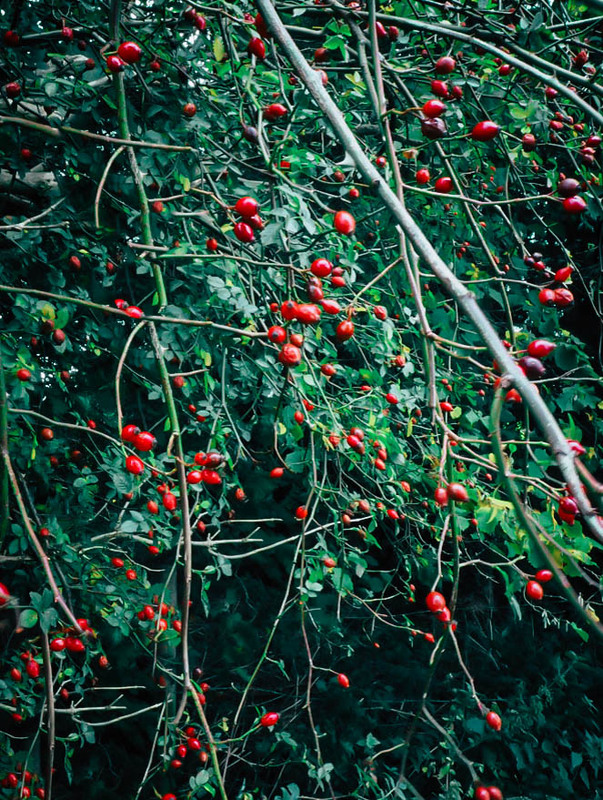 There is so much beauty in the cycle of the seasons and the bounty that quietly waits in the hedgerows each autumn. It is more than just fruit or jars of jam. It is continuity and memory and, most importantly, it is family. For my dad, who was diagnosed with alzheimer’s last year, those hedgerows and verges are to him what a warm, scented madaleine was to Proust, and hearing those happy memories triggered so vividly by the sight of a gnarled, old fruit tree mean so much more to me, and to him, than I can say. 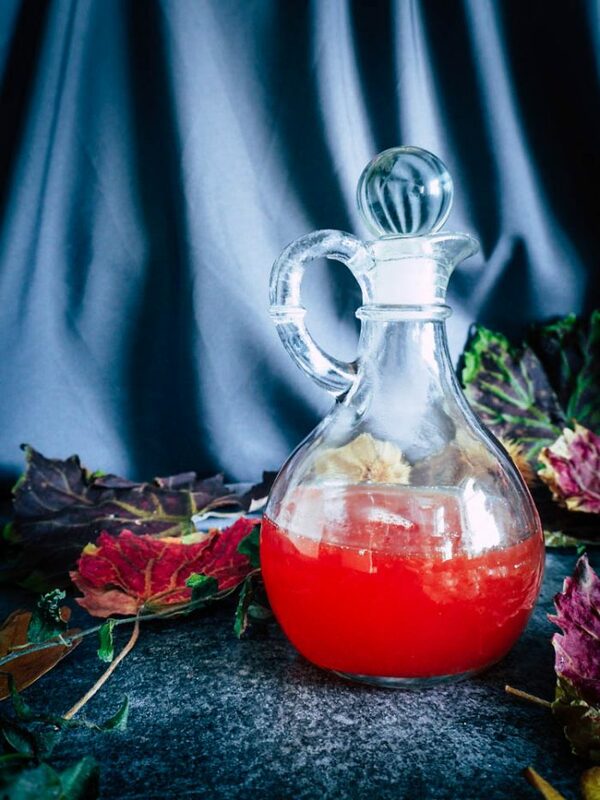 Rosehips are plentiful at this time of year and make the most delicious, citrusy syrup that is an amazing source of immune system boosting vitamin C and is very simple to make. It is delicious drizzled over yoghurt and berries, stirred through creamy rice puddings or added to a glass of bubbly for a very british hedgerow cocktail. Put the rosehips in a food processor and blitz just until they are roughly chopped. Transfer to a saucepan and cover with the water. Simmer gently for 15 minutes. Fold a decent sized piece of muslin in two (to make a double layer) and place in a metal seive over a large bowl. Strain the rosehip liquid through the muslin. Don’t be tempted to rush it, just leave it to sit for half an hour to an hour until all the liquid as passed through to the bowl. 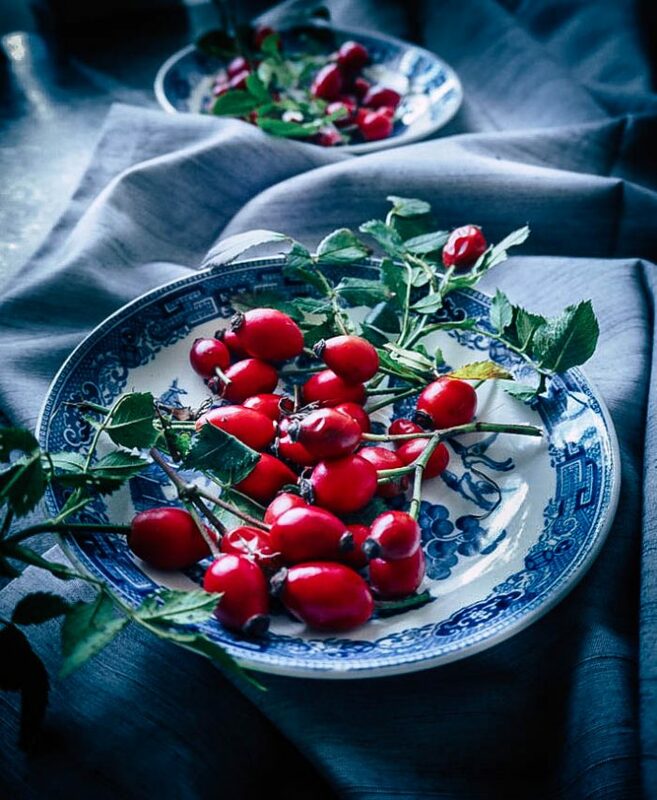 Discard the rosehips. Using a fresh piece of muslin repeat the process to remove any remaining hairs. While the liquid is straining, sterilize a few bottles (I use Kilner, but any vinegar-proof bottle or jar will do) by washing in hot, soapy water, rinsing thoroughly and placing in the oven at 130c for about 15 minutes. Turn off the oven but leave the bottles inside until ready to use. Once the rosehip liquid is strained, measure the quantity before returning to a clean saucepan. For every 500ml of liquid add 350g of granulated sugar. Heat gradually (stirring until the sugar dissolves) before boiling for 2-3 minutes. Skim off any scum. Remove from the heat and transfer immediately to the prepared bottles and seal.